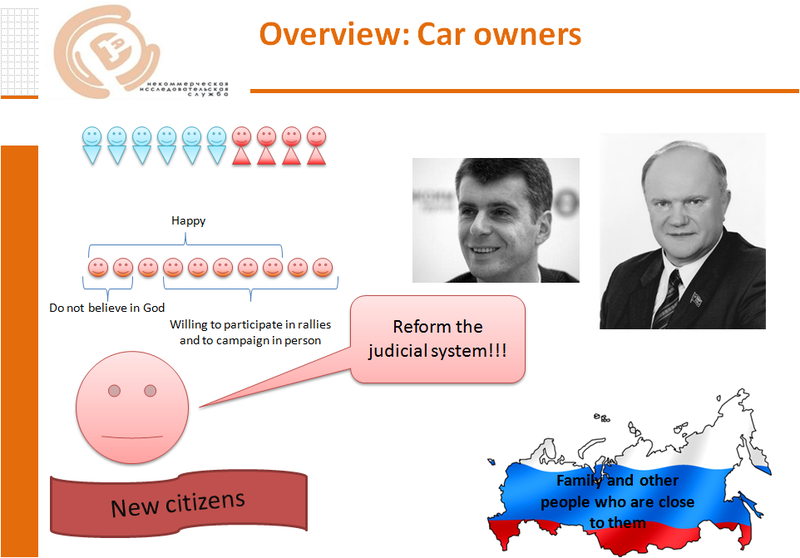 THE TYPOLOGY OF THE PROTESTERS : Non-profit research based consulting "Sreda"
The independent research service “SREDA” presents additional data from the results of the surveys of participants in the “For fair elections!” rallies, which took place in Moscow December 24, 2011, February 4, 2012, and March 10, 2012 (each survey was taken by 200 people). In what ways are you willing to express your protest? Why did you attend the rally? 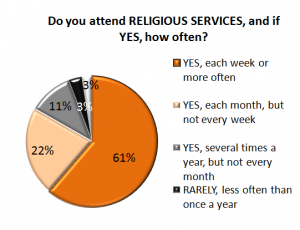 Are you likely to participate in the protest movement in the future? From the following list, please choose which THREE tasks you consider to be of the highest priority for the Russian government? What kind of civic engagement are you personally willing to participate in? “Fellow travelers”—about 5–10% of the participants came out of curiosity or for company; they were largely undecided in their views and had no clear civil position. In making their demands, they did not criticize the authorities, but rather called for general social reforms. Of the various forms of civic engagement, they are interested in charity. Their protest activity will either end completely after one rally or will continue only in the form of attendance at authorized rallies. Sympathizers—about 30–40% of the participants were spurred on by the general wave of protest (“Enough is enough!” and “We sick of being patient!”) in connection with the demand for legitimate elections. They declare that they are defending their civil rights and recognize the need for certain changes in the country, reform, and complete or partial modernization. But their readiness for outright protest and social and civic activity may be questioned: the election situation has become their pretext for protest, and the rallies give them the opportunity to defend their rights in a general mass protest; however, after a series of rallies, these protesters will return to their former way of life. This group is not the force that propels the “train” of protest, but rather comprises wagons of that train. Their key value is family. 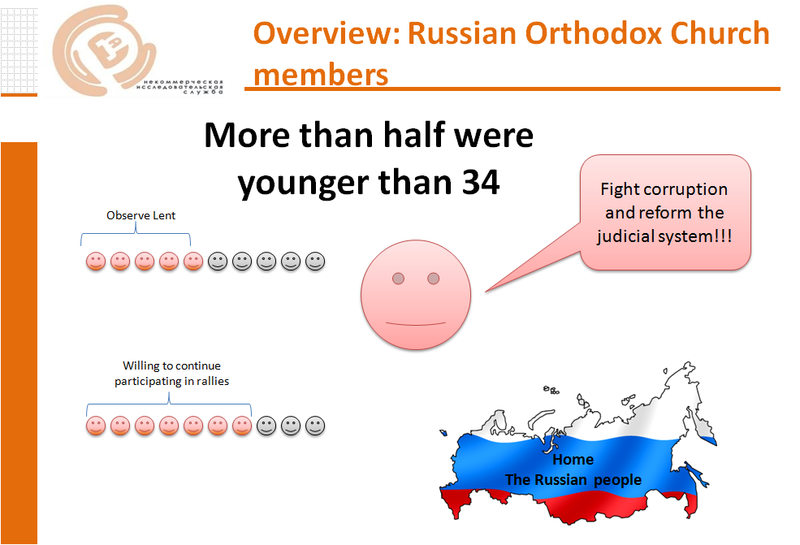 Activists—about 30–40% of the participants are “mature” citizens with their own sociopolitical agenda, who persistently demand favorable reforms and justice. They are willing to continue to express their position through protest activities, campaigning, public discussion of drafted laws, and sociopolitical activity. In contrast to the other groups of participants, this group will continue regardless of whether the rallies continue; for them, rallies are just one way of expressing their social position and an opportunity to achieve positive changes. The defining values of this group are family, justice, and honesty. This group is the force that propels the “train” of civically active citizens. Dissenters—about 10–15% of the participants are constant participants in the rallies; these are citizens who are dissatisfied with the current regime and who on principle strive for changes in the government, the freeing of political prisoners, and new elections. For them, this is more important than the more detailed daily sociopolitical agenda. They are willing to “go all the way”: to go into the political underground and to physically resist the government. They highly value freedom. While this is not the force that propels the “train,” this group does provide a “spark” of activity and, like the other types of citizens, plays an important role. 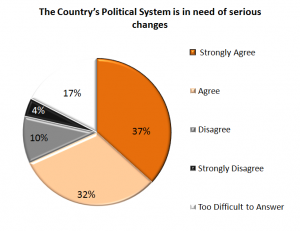 Sixty-three percent are, to some degree, willing to participate in local elections, 52% want to control the government’s actions, and 42% are willing to participate in the establishment of political parties and movements (03.10.2012). In the face of low levels of trusts in the government and in opposition leaders, the majority are certain that US support of the opposition movement is nearly impossible—a 3 on a scale of 1 to 10. Moreover, 74% identify poor organization, lack of leaders, and disunity as problems of the civic movement; 42% consider themselves as “new citizens” speaking out for “fair elections,” rather than as the opposition (03.10.2012). This desire for change is expressed not only in people terming themselves “new citizens,” but also in who the participants picked for their leaders and who garnered the most votes. 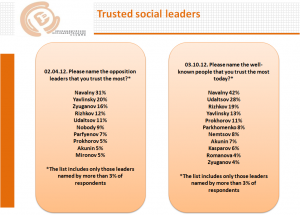 The most popular opposition leader is Navalny (31% 02.04.2012 and 42% 03.10.2012); the others’ popularity levels are volatile (Yavlinsky comes in second, followed by Udaltsov; as to the “veteran” of the opposition, practically nobody has hope in him). It is also worthy of note who the participants voted for in the presidential election on March 4—for Prokhorov (45% 03.05 and 43% 03.10). At the same time, the majority who voted for Prokhorov indicated that the voted for him not because they support his views, but rather out of a feeling of protest. 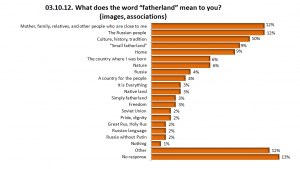 Russia, as in many previous periods of its history, is at a crossroads, as is shown by the respondents’ assessments of their identity in the March 10 survey. The question was “Rate on an 8-point scale (1—weak affiliation, 8—strong affiliation) to what degree you identify yourself with. 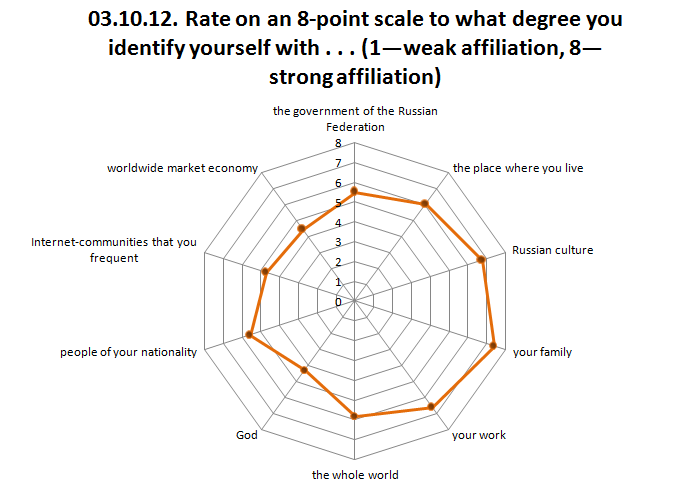 . . .” The majority of the respondents did not at all identify themselves with the “government of the Russian Federation,” but rather with “the place where you live,” “your family,” and “your work.” At the same time, the responses in regard to the identity show a clearly distinguishable nationalistic component—identification with “Russian culture” and “people of your nationality.” People in creative professions and with higher education were more likely than others to indicate that they also identify themselves with “the whole world.” On the one hand, naturally, supporters of a powerful state (supporters of “vertical power”) do not constitute a majority at the rallies, but on the other hand, the fact that, as a whole, they feel like “people without a country” is alarming. People’s consciousness reflects the need for a conservative ethical program—essentially, the survey takers simply require lies and theft to cease. Basic values: (1) family, (2) freedom, and (3) justice. 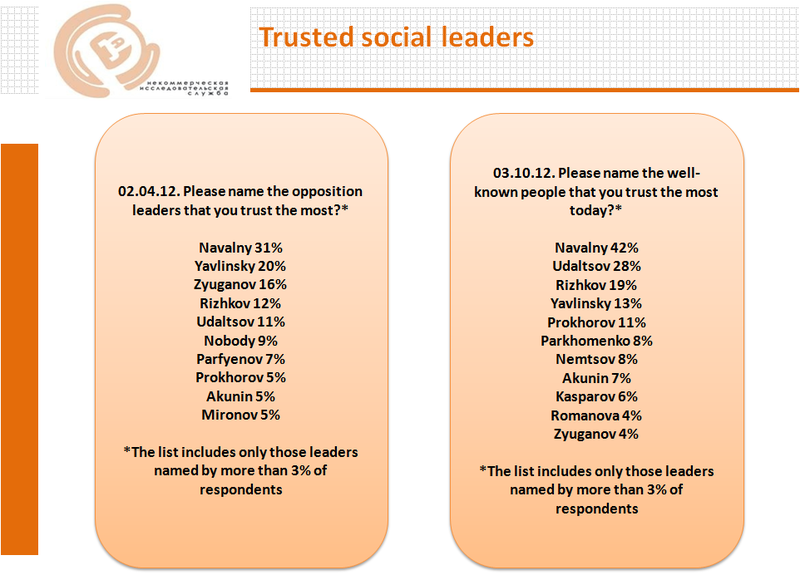 Honesty is considered increasingly more important among the values. Most important tasks: (1) reform of the judicial system, (2) recount of the results of the presidential election, and (3) fight with corruption. 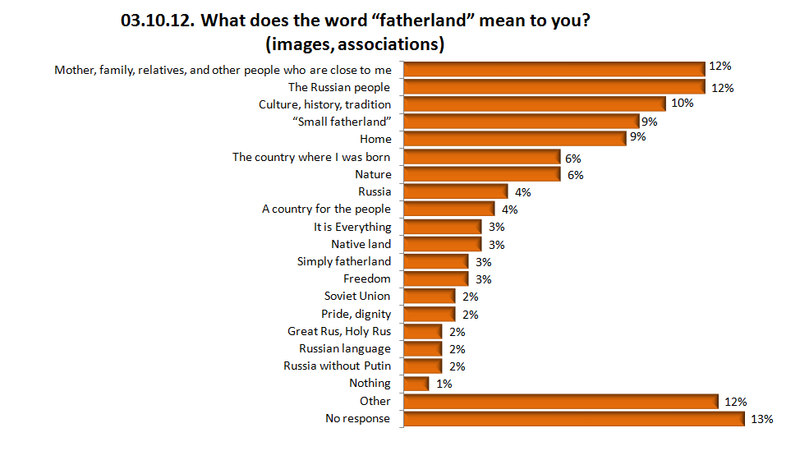 They associated family, relatives, and other people who are close to them; the Russian people; and culture, history, tradition with the word “fatherland.” Unquestionably, at all times people want to live more or less honestly, in freedom, and with family and traditions as priorities. Hence, the results of our survey may be considered as a statement of certain common purposes of the educated part of society. However, this case is rather complicated—based on the survey, it seems that people do not trust any institutions (neither the government, nor the opposition, or even the Russian Orthodox Church), that is, they do not believe that the current institutions have carried out, are carrying out, or will carry out their ethical program. 03.10.12. Which of the following names best describes the protest movement?